The moon will look full tonight as it shines close to the constellation Gemini’s brightest stars, Castor and Pollux. The moon will not actually be astronomically full – or most opposite the sun – until tomorrow, on Wednesday, January 19. Although we draw in the stick figure of the Gemini Twins on tonight’s chart, you will not see much of Gemini in the moonlight except for Castor and Pollux. By the last week in January – after the moon drops out of the evening sky – look for Gemini to shine in all its starlit majesty. Are you familiar with the winter constellation Orion? If so, draw an imaginary line from the star Rigel through the star Betelgeuse to locate Castor and Pollux. 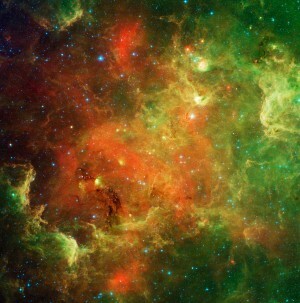 Star-hop to Castor and Pollux tonight. Then try this trick on a moonless night. With binoculars, try finding the star Wasat close to tonight’s moon. As seen from North America this evening, Wasat shines about one pencil-width to the north (left or upper left) of the moon. Wasat is a rather dim 3rd-magnitude star, yet it is special because it sits almost exactly on the ecliptic – the sun’s yearly path in front of the backdrop stars. The sun and Wasat have a conjunction every year on or near July 10. In other words, on that day, Wasat and the sun rise together and cross the daytime sky together, with Wasat located behind the sun, vastly more distant from Earth. 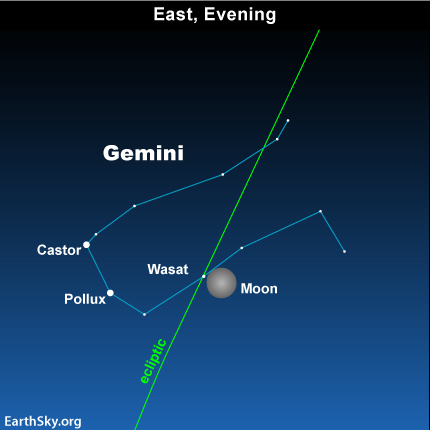 Let tonight’s full-looking waxing gibbous moon guide your eye to Wasat and the bright Gemini stars, Castor and Pollux!